Considering that he was considered ‘shy’ and even ‘not suitable’ for business by his first employer, Deacon Davis, the rise of Marshall Field from employee to businessman was meteoric. In the late 1800’s, when Marshall Field and Co. was established, Field became one of the wealthiest men in the United States and was considered a pioneer and a true business leader in his time with the progressive retailing practices he established. Marshall Field first worked as a clerk for Cooley, Wadsworth & Co. and became a junior partner in the company in 1862. Later, in 1865, he joined other businessmen to manage Field, Palmer and Leiter which eventually became Marshall Field and Co. in 1882 when he bought his partners out. Marshall Field was considered daring in his move to create one of the biggest department stores in the world in Chicago which was a hugely unsettled community and outpost at that time. But he knew who his target clients were — the increasing number of Midwestern middle class shoppers. Field then instituted and applied several innovations in his shop which are still adapted today by many department stores and malls. lively and attractive display windows. Aside from these, Field also brought in cosmopolitan items from his travels around the world and sold these in his store. Not everything was smooth sailing for Field’s company though. In the stretch of its development and growth, the firm also faced troubling times such as the panic of 1873 and the Great Chicago Fire. But it was able to endure all these and Field went on to invest on the rapid growth of Chicago’s population. During his prosperity, Marshall Field developed and produced his own line of products in several factories located in China, Spain, Italy, Germany and Australia. He heavily advertised his products and shops in various newspapers and separated his income from his retail business from wholesale. 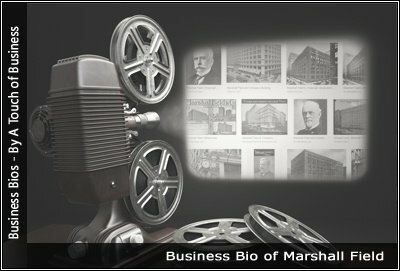 Company: Marshall Field and Co.
Marshall Field was a philanthropist and a generous donor to various charities. In 1878, he founded the Art Institute of Chicago and donated the land where the University of Chicago is now located. In addition, Field is also credited to have contributed greatly to the establishment of the Field Museum of Natural History.